Trailhead and parking area are on Lime Kiln Road in Haverhill, NH (summit is in Benton). Lime Kiln Road leaves the north side of Rt. 25 8.8 miles northwest of Rt. 118 and 4.9 miles east of Rt. 10. The parking area is 3.1 miles up Lime Kiln Road, on the right side. Look for a Chippewa Trail sign. Black Mountain is located in the Benton Range, in the far western extent of the White Mountains. One of only two trail-accessible mountains in the range, it provides nearly 360-degree views from its wide, rocky summit, as well as a very scenic hike. The Chippewa Trail begins in a wetland. It descends a dirt staircase, and winds through through the open forest. It crosses two brooks, then passes a beaver pond with a view of Sugarloaf Mountain. It then leaves the wetland area and leads out to a logging road. Here, you can take a short historical detour to see the Black Mountain Lime Kilns, which were once used to process limestone from the best limestone quarry in the country. Turn left onto the logging road and walk 50 yards, then turn right onto a path that leads to the kilns. A kiosk gives some history about the kilns. Climb the hillside behind the tallest one to see inside. The main trail turns right to follow the logging road, but soon bears left off of it (watch for blazes) to climb moderately uphill. It passes a Forest Society property sign while climbing. The trail passes an old foundation in a clearing, descends slightly, then begins to climb much more steeply. Soon, the trail begins switchbacks, and the forest changes to an evergreen forest. After a short climb, a spur on the right leads to a ledge with a great view to the south toward Smarts Mountain, Mt. Cube, and Piermont Mountain, and west into Vermont. The trail continues climbing to another viewpoint to the west and soon emerges on open ledges with good views. After much climbing over the ledges, the trail re-enters the forest and circles around the summit to ascend from the north side, reaching it at 1.8 miles. The summit has a great close-up view of the massive Mt. Moosilauke. 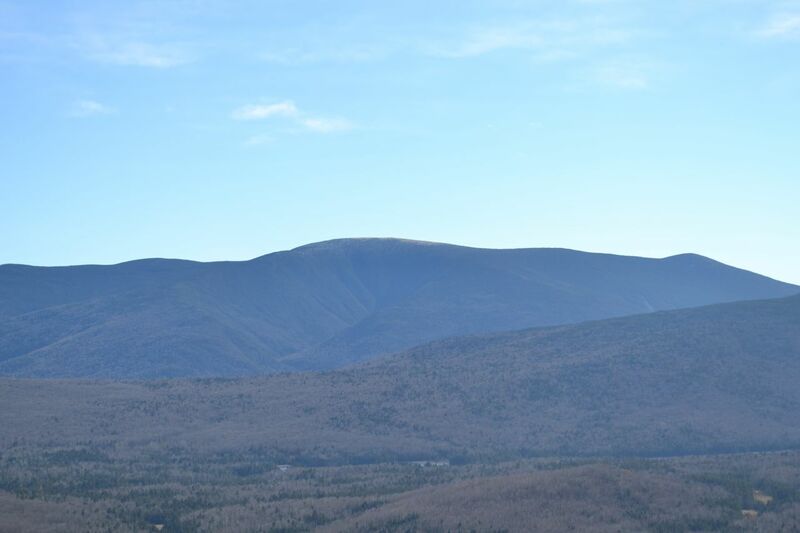 By exploring the summit ledges on the north side, you can also see the Kinsman Range, with the Franconia Range behind, while a ledge on the south side provides a wide view into Vermont.